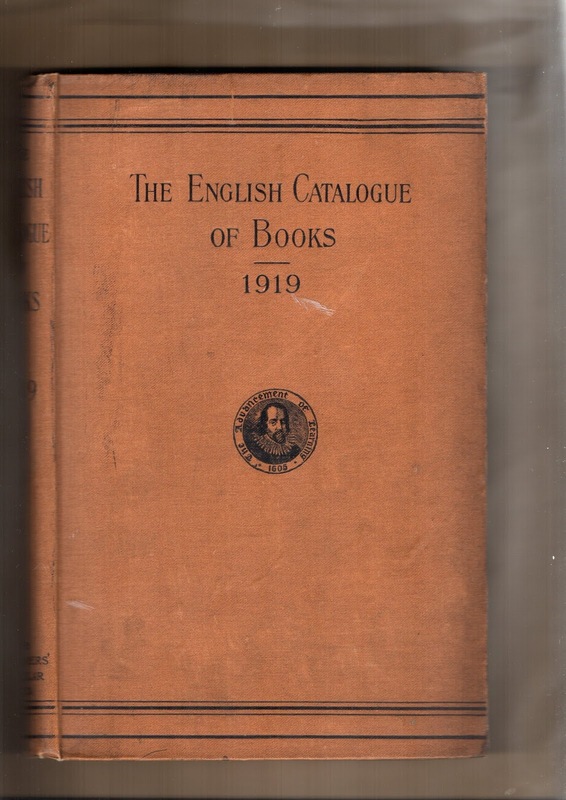 It perhaps goes without saying that after I had acquired The English Catalogue of Books for 1937, my thoughts next turned to the volumes for other years. In no time at all, I had decided I also needed the Catalogue for 1919. This volume was somewhat slimmer than its successor of eighteen years later. The year was still affected by the exigencies of war. Indeed, despite the exact timing of the Armistice, the dates of the war were not settled for quite a while. It is still possible to see war memorials in Britain which give it as 1914-1919, possibly because some soldiers were still engaged in conflicts in that later year. There were little-known military episodes such as the Allied Intervention in Russia, a disguised attempt to aid the Tsarist forces, and skirmishes with German freebooters, not least in the Baltic. J C Squire, surveying 1919 in an editorial in the London Mercury for January 1920, said that he thought it might in future be regarded as a war year. The number of books published in Britain and Ireland in 1919 was, according to the catalogue, 7,327 new titles and 1,295 new editions (reprints). This represented an increase of 906 from 1918, which the editor regarded as a satisfactory indication of the return of peace. The volume was, however, still sufficiently slim for me to skim all the way through it, making notes of those books I would have been tempted to buy had I been around then. Difficult to resist, for example, White Snow, by “A Young Actress” — who probably wasn’t – the confessions of a cocaine-taker, or Dope Darling by Leda Burke, who certainly wasn’t – she was David Garnett – or indeed Dope by Sax Rohmer. Clearly novels of the white powder were en vogue that year. Connoisseurs of apocalypse might, however, be more drawn to The Sixth Vial by L Argyle (which at least makes one wonder what happened to the seventh vial, perhaps still to be spilled). It was quite a good year for novels of fantasy and the supernatural. If the Proserpine Prize for such books that I outlined in my account of the 1909 awards (see Seventeen Stories) was still in existence despite the shady transactions of that year, there would certainly be a number of titles in contention. Stella Benson’s Living Alone, for example, the story of a young woman with powers of witchery, would rightly have its champions, as would Ronald Firbank’s exotic romance Valmouth. In the brisker style of the popular thriller, Gerald Biss’ werewolf yarn The Door of the Unreal might be on the shortlist, together with the hard-to-resist title The Shrieking Pit by Arthur J Rees. The more reflective pleasures of A P Barker’s A College Mystery, so well constructed a ghost story that it has often been taken for real, certainly ought to be under consideration, together with Madeleine by Hope Mirrlees, which I have never read since it is so hard to get, but which must surely have some of the imaginative qualities later found in the author’s Lud-in-a-Mist. Of books by less established hands, Squire singled out five for particular mention: Romer Wilson’s If All These Young Men; Clemence Dane’s Legend; The Mask by John Cournos; What Not by Rose Macaulay; and The Young Physician by Francis Brett Young. It would be fair to say that few if any of the seven in total he named have much survived: maybe just the Conrad. Two unlikely and peculiar books from the same time have perhaps fared rather better. It’s hardly surprising that war memoirs, both fictional and factual, soon began to appear in this year. One of the strangest was certainly The Road to En-Dor, by E H Jones, the story of an escape from captivity. It achieved success as soon as it was published, was constantly reprinted, and still attracts fascination today: there have been various proposals to make a film of it. The secret of its appeal is the very unusual way in which the two heroes of the tale tried to get out of their Turkish prison – by faking ghostly spirits using a ouija board, and convincing the commandant that these could lead him to a hidden treasure – and, incidentally, mastery of the world. Eventually, mostly by pretending to have gone mad, they were indeed released – just weeks before the end of the war. Like the exploits of T.E. Lawrence, the exotic locale, bizarre story and sheer high spirits and ingenuity of the protagonists caught the public imagination. The second unusual title of 1919, which still has its admirers, me included, is The Journal of A Disappointed Man by W N P Barbellion, the pen-name of Bruce Cummings. He was a British Museum naturalist suffering from multiple sclerosis, who gives insouciantly his date of death on the last page of his book (in fact, he survived a further two years). His diary consists of nature observations, but more to the point observations about himself – his moods, hopes, worries and the gradual understanding that he has a fatal illness. Aphoristic and audacious, it is not a sombre book, despite the tragedy: the author’s keen intelligence, self-awareness and terse style give it a lasting interest.
" the dates of the war were not settled for quite a while. It is still possible to see war memorials in Britain which give it as 1914-1919"
That is because the armistice was only a suspension of the war, not an end to it. For example, the naval blockade of Germant continued until the Treaty of Versailles was signed on 28 June 1919. That was the formal end of the war. There were fears it might resume before that: although the Allies allowed Germany to import food under supervision in January 1919 the Germans refused to allow German ships to enter foreign ports to collect it as they would be confiscated if fighting started again. I should have said: The Arrow of Gold must be one of the worst books ever written by a great writer. Thank you, Roger, for that interesting information about WW1. We're so used in the UK to it being the "1914-18" war that it's useful to be reminded it was a bit more complex than that.